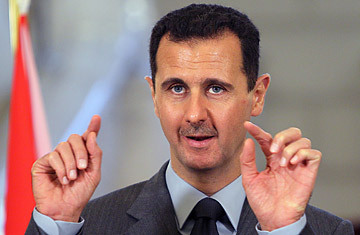 Syrian President Bashar al-Assad during his visit to Romania, November 10, 2011. In his 11 years in power, Syria's President Bashar al-Assad, has cultivated an everyman image of himself, in stark contrast to the formal, distant mien of his late father and predecessor Hafez. The late president was feared more than he was loved. Syrians remember the fate of Hama, the city that dared rebel against the regime in 1982. It was flattened and at least 10,000 people massacred. The current president, a physician by training, is young (45 years old) seems accessible, charming and above all visible, whether he's strolling through Damascus's souks with his young family or dining in local restaurants. It's a public image that has endeared him to millions of his people, from taxi drivers to schoolgirls. But in the 10 days or so since nationwide protests rattled what remains a repressive police state, the President has been as faraway as his father  and perhaps even more invisible. He has been constantly rumored to be just about to address the nation in its gravest crisis in decades. But again and again he has not appeared. Assad is once more scheduled to deliver a speech  on Wednesday to Parliament. But that is another day's delay. Why has it taken Assad so long to speak to his fellow Syrians? There's already a Twitter hash tag (#whyAssadislate) offering its own tongue-in-cheek reasons. But the delay may indicate something serious is going on behind the scenes. There is speculation of, at best, indecisiveness, and, at worst, a feud among the president's tiny circle of family advisers. The key players are his younger brother Maher, who heads the Republican Guard, as well as General Asaf Shawkat, who is married to Bashar's older sister Bushra, and who is deputy chief of staff of the Syrian army. Then there is the first cousin, Rami Makhlouf, a tycoon who controls the country's mobile phone network, SyriaTel. "I'm not saying that their disagreements have reached the point of posing a challenge, but I think there isn't one decision, one view about how to respond to the people's demands," says Ammar Qurabi, head of the National Organization for Human Rights in Syria. "The decision doesn't appear to have been made ... and I think that's why he has delayed his address." In the meantime, the regime has responded to the unprecedented protests (which have, for the most part, called for reform, not quite a government overthrow) with both carrots and sticks: an apparent promise to lift the nearly half-century old emergency law has been combined with live ammunition fired into the crowds. The security crackdown has left at least 73 people dead, according to Human Rights Watch. Amnesty International has a higher death toll of 92. The confusion comes with the slew of reforms promised even as the repression occured. First, Presidential adviser Buthaina Shaaban dangled a slew of possible changes, including repealing the 48-year-old emergency law, liberalizing media laws and permitting the formation of political parties other than the ruling Baath. Then, on Tuesday, the government of Prime Minister Naji al-Otari resigned in what seemed to be a housecleaning. But dig a little deeper, and the concessions don't seem to go far. Prime Ministers come and go in dictatorships  and they are almost irrelevant in states like Syria, which like Hosni Mubarak's Egypt, had power concentrated in the hands of the president and a select few. But some observers are heartened: at least they are a start. "What will mean something is if the new government is a national unity government," says Qurabi. "Will other views be represented in it, will it have members of the opposition? Or will it be a government like all the others but with different names? That's not what we want. We don't want speeches, we want developments on the ground." On Wednesday, if he speaks, Assad is expected to offer further concessions. But will they be enough to defuse the crisis? Will Syrians continue to view their president with an affection they clearly do not extend to his regime? Or will they no longer believe him? Reform has never been Assad's strong suit, despite the fact that he has spoken often of it. In 2000 when he came to power, he derived his legitimacy from his fearsome father's legacy, but seemed keen to break from it, introducing the so-called Damascus Spring, a brief experiment in freedom of speech which saw political salons sprout up. The notorious al-Mezze prison was shut down and a number of political prisoners were released. And then, suddenly, spring was over. Many of the members of these free-speaking neighborhood salons were rounded up and jailed. Assad will no doubt deliver Wednesday's speech mindful of the fact that similar climactic declarations were ultimately preludes to the falls of the leaders of Tunisia and Egypt. "If Syrian protests continue after his speech on Wednesday, then he would have used his most valuable tool, addressing the nation, in vain," says Hussain Abdul-Hussain, a Washington-based Middle East analyst. "If protests continue, his speech could spell the beginning of the countdown of his rule." On Tuesday, hundreds of thousands of Assad's supporters filled the streets of Damascus and several other cities in a massive show of force, a clear attempt to bolster the regime and present Assad as a popular, not isolated, president. But how much of it was real? Schoolchildren were given the day off and civil servants had been allowed to show up late for work. Assad has survived American neocon calls for his demise as well as regional and international isolation following the murder of former Lebanese Prime Minister Rafik Hariri in 2005, an assassination widely blamed on Damascus. He also deftly dodged the war next door in Iraq, while accommodating the massive influx of Iraqi refugees into Syria. But now he faces what may be the greatest test of his political life. It's enough to continuously delay the day of reckoning. George Jabbour, a former parliamentarian and advisor to Hafez al-Assad, downplays what many others see as Assad's dithering. "I think that perhaps the delays are just so that the anticipation builds," he says. Assad is a thoughtful speaker and an orator who rarely relies on notes, unlike his late father, who was nowhere close to rousing. But if Bashar's speech lands flat tomorrow, what else can he do to stay in power? Perhaps then the world will see how much of his father's son Bashar al-Assad really is. See a TIME Special Report on the Middle East in Revolt.